Under the Whyte notation for the classification of steam locomotives, 2-6-2 represents the wheel arrangement of two leading wheels, six coupled driving wheels and two trailing wheels. This arrangement is commonly called a Prairie. They were designed as small mixed traffic branch locomotives, mainly used on branch lines. They were a development of Churchward's 4500 Class with larger side tanks and increased water capacity. 100 were built numbered 4575–4599 and 5500–5574. A number were fitted with auto apparatus in 1953 to enable them to run push-pull trains on South Wales lines with auto trailers. 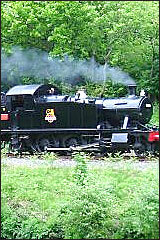 This sound recording courtesy of South Devon Heritage Railway, Buckfastleigh, Devon, UK. Visit arranged by Ted Smale. All sounds recorded by AJ Ireland at Buckfastleigh, Devon, UK June 11th 2007.
project: BR_44XX.spj SDF: BR_44XX Author AJ Ireland Digitrax Inc.